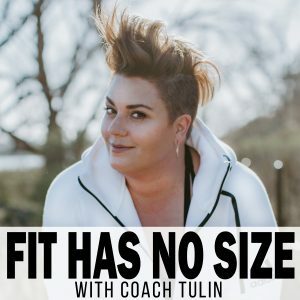 Welcome to this episode of Fit Has No Size with Coach Tulin. I am Coach Tulin. Today’s topic is something that’s very near and dear to my heart. It can be a source of massive struggle, and it can also be a source of massive celebration. It could be something that holds you back from moving forward. It could be something that, hey, I took that step the hardest day is done. So our topic today is day one, the hardest day. Why is day one so hard? Well if you’ve listened to previous episodes of Fit Has No Size, I touch on the struggles. The reasons why day one can be so complicated, and to give you an idea of how this can be such a source of anxiety, of self-doubt, of moving forward from a place of not self-love for sure. I have coaching communities. For example, my Fit Has No Size membership community or those that I personally coach or my own journey. I have personally coached a couple thousand women in this process. My coaching content is based off of my journey but also the journey of many I’ve coached. And day one is that day that they struggle with most. It’s the hardest day. If it’s so hard, what do I do in my coaching community? Well, I’ll tell you this. I provide a week’s worth of content going over all the things that I have known that have kept countless people before them from moving forward, and I touch on all those things. And I help create day one into a space of celebration. Something that you work up to. You’re not worried about 30 days from now or two weeks from now or 60 days or that size or weight or whatever it is connected to some date or event. No, no, no. The first focus is just getting started. What’s stopping you? What’s scaring you? What are you afraid of? Are you afraid you’re going to quit again? Are you afraid of failure? Are you afraid of judgements of other people and judgment of yourself? Those are really real things, and so here’s what happens. A lot of times people getting really excited about started on something and then day one comes along, and they might show up at their local gym and they might sit outside that gym for a long, long time before they walk in those doors. They’re not feeling super confident about themselves. They might be wearing their spouse’s sweatpants and T-shirts trying to hide themselves. Knowing for sure that they are unsure of where to even start. Feel like they’re going to be judged. They feel like somebody that everyone at the gym is going to notice them. They feel like they’re going to be a laughing … so many feelings that are involved. Now, I’ll tell you. There are instances where those kinds of feelings do ring true, but I’ll tell you most the time it’s really these boulders that we put up in front of ourselves to stop us from doing what we need to do. It’s a negative self-talk. I’m not going to say it doesn’t happen in gyms. I’m not going to say it’s never happened. Heck, I’ve had it happen to me, but for all the times that I’ve spent. I’m just using the gym as an example. It could be a yoga studio, it could be Cross Fit, it could be a workout DVD at home, it could be a personal trainer. Right? Some of those things you feel like you have something to follow, like a personal trainer, for example, but most cases, most people feel really lost, and they don’t know where to start, but they have great intentions of getting going, but they’re fitness is usually starting from a place that lacks self-love. It’s usually this feeling of being deprived or coming from a place of punishment because of the weight they gained or that they used to be a former athlete or the body they had when they got married or when they’re 16 years old and now they’re 45. I mean, there’s so many different things, but I hadn’t met anybody prior to my coaching, as an example, that moved forward from a space of feeling good about themselves. I take a whole week to just prep mentally from the most positive uplifting place ever. From a place of understanding, because I do understand because I’ve been that plus-size woman, and I still am on a plus-size woman on a journey to fit, but I know those feelings. I know what it feels like. It can stop us. That day one sometimes you pull up to the front of the gym and you sit in your car, and just to walk through the two glass doors in the front. Just to be able to turn the car off, open the car door, take one foot out, then the other foot, and walk towards the gym doors can feel like the longest walk ever. The second longest walk is when you actually get in the door and you look at all this equipment, even if you used to lift. Even if you knew all that equipment, there’s just something about this day one feeling that you just look around that you just feel very lost. I can’t tell you how many people that I’ve known that have turned around and left. Now, some of them made it in the door. Some of them handed them their card. The beep goes off as they scan it. Maybe they signed up in that moment, and they move forward and they look at all the equipment. They look at all the classes. They’re looking at the people in the classes. They’re looking at the instructors. They’re looking at these people who are using the machines who seem so confident in what they’re doing like they know what they’re doing, and we go well, I know how to work the treadmill. There’s a quick start button. I’ll just click quick start. Or the recumbent bike. And because we didn’t know what to do and because we created these great expectations in our head, it’s not uncommon to not go back. There’s different phases in this idea of day one. It can be, like I said, it can be just the idea of getting started. You could never walk through the doors, and again, whatever those doors represent to you. Whether it’s an actual physical gym or it’s a yoga on the beach, or whatever those doors represent or popping in the DVD at home or playing something that’s on YouTube or whatever. Those doors can represent a lot of different things, and I will tell you I’ve worked with people it’s taken months and even years to get to day one or passed it. It was like that for me too. Day one was this constant source of pain. I guess that’s the way I can say it. It just held up my mirror to my life and the self-talk just go more and more negative, and I found that I wasn’t going to go do this movement from a place of self-love but from self-punishment for the weight that I have gained or how I’ve let myself go and all these negative things that I’ve said to myself. I’m like my goodness. This body has got me through some pretty amazing stuff. Some pretty tough stuff. Broke and homeless with two kids. A husband with multiple sclerosis who lost the ability to walk for two years. I watched him relearn his ability to walk. I’ve watched him reteach himself to swim. I think about all the struggles along the way when he nearly passed away two years ago at the time of this podcast, literally this month. Wild. Wow. I think we’re right there and to have to pull through that, but those are only two examples. If I talked about thing that had happened in between. There’s a lot that went on, and so the 180 pounds that I gained on this journey and the 100 pounds that my husband gained was our coping mechanism. My husband is a former athlete, quite the athlete by the way. Loved lifting all those things, and even he had his struggles, right? How is it any different because he’s had maybe greater experience than I did. It’s no different. It’s absolutely no different. We can talk ourselves out of day one over and over and over again. We are a master at it, and because we’re a master at it, the amazing part is to actually get yourself moving forward into day one is the exact same mechanism that you had in the negative space. It’s just doing the same activities from a positive space, but how do you know how to do that? Listen, support communities are important. Like I said, my Fit Has No Size membership community, that’s why the support is key. It’s positive, uplifting, no negativity. My other coaching group, same thing. I have a negativity-free zone. When there’s negative people around me, I can feel it in my gut, which is a long, long way from where I started because I actually looked for the negative people and the people who were unhappy because it made me feel better because there were other people who are unhappy and misery less company. Here’s the deal you guys, day one. Because I take that whole week to do it, and I think we think it’s a start of the rest of our life and it can be. Every new minute, every new day, every new month isn’t that nice to feel like it’s a fresh restart? It’s something that we get to start with a clean slate. I like to think of it as another chapter in our book. Why? Because my body tells a story of what we’ve overcome. Of the things that we have figured out and gotten on the other side of. Over and over again those are just two large examples I gave you. The number of examples in my life and in your life are huge and if you don’t show it on your body, everybody holds it in their cells, and in their joints, and in their muscles, and in their posture. We hold it in our bodies the struggle that we’ve been through, but if we’ve been through a struggle, we have found a way to get on the other side because we’re still here. We’re still fighting. We haven’t given up on ourselves, and so I like to look at day one as another page in our book of life. It’s just another page. It’s just a day that’s going to come up. It’s a big deal day. It’s a day of celebration. It’s huge, preparation is everything. Coming from a place of understanding. Being able to relate to what they’re going through and having somebody to feel they’re not there alone. Believe me I get all that. I do all that. It’s what’s in my coaching groups, but day one doesn’t have to be this monster. It’s just working with people or coming from a place or reading a book or whatever. There’s so many places of inspiration, whether it’s my podcast or whatever, someone else. It’s being able to not feel alone in this journey, and to put day one into perspective and to not blow it up into such a big deal, but then to celebrate the heck out it. It’s kind of a balance, right? It’s like a game that you’re playing, but it all comes in the prep, and it all comes in the prep without shame or self-punishment, or self-hatred, or lack of self-love, and when you look at it as another page in the book of your life, then it’s just like this is another day. This is another struggle that I’m learning to cut over. How do you know you’re going to be able to do it? Because if you look at your previous chapters and your previous pages in your book of your life, you can find example, after example, after example of struggles you’ve had that you have overcome, and if you’re plus size, I know you’ve been through some stuff and I know you’ve overcome some stuff. It’s just somehow we think that that fits in one box and this is another. It’s the same thing. Day one, is no more difficult than anything else you’ve been through. It’s just a day. It’s a fresh start. The preparation for day one. Why should you celebrate it? Because you freaking did it. You got it done. You busted through those doors and even if it was still walking into gym I’m sure, using that example again, and going and doing the treadmill or the recumbent bike and you got 20 minutes done or two minutes done. You guys, when I started on my journey, I started doing two to three minutes of exercise at the time. I did it to the workout DVDs. I did the Shaun T Insanity. They jumped, I swayed side to side. They were doing all those other stuff, I swayed side to side. It was the most I could move my body. I couldn’t even get up and down on the floor at roughly was at 375 pounds they guessed they think that I weighed because the scale didn’t go any higher than 350 and I knew I wasn’t 350 because that scale slammed stop at 350, and for how quickly I gained weight is a pretty safe estimate. I knew I was sliding into 400 pounds. Now, we think we haven’t done enough, but when I tell you that the start of your journey is your own. That this journey is your own. That what you choose to do right now may not be what you do six week from now, six months from now, six years from now. It’s just a day one. It’s a starting point and it is a commitment to going and getting it done, and celebrating that you did, and in all honesty, you really should be celebrating each and every time you go in to do something and you complete it. Celebrate it. Celebrate the fact that you were on the recumbent bike. Now, for me, the recumbent bike was tough because it took two measuring tapes to measure my middle. So it’s over 60 inches in my waist. I’ve now lost over a foot. The recumbent bike was difficult because it’s something that looks like oh, that’d be the easy place to start. Here’s the reality, getting into the seat, lifting my leg over the recumbent bike to put it on the other side because my belly apron was so far down my thighs, so not only was it difficult to not have the strength in my muscles to do it, but I now have the extra resistance of my belly, and then to put the other one, and then trying to put my feet into the straps was complicated, but I did it, but I got it done, and I was only able to do a few minutes, but when I evaluate day one compared to where I was a week ago. Now, listen. I don’t want you to go back to when you were an athlete or what you did in high school, or what you did in the Olympics, or what you did for fun, or you were like the jazzercise mama. I’m not talking about that. I’m talking about in recent history getting to the gym, doing the two to three minutes, 15 minutes. For me it was tow to three minutes of Insanity at home, okay? Where were you a month before? Where were you just a week before? Did you do this? And if you haven’t, celebrate that. It’s a non-scale victory. It’s enormous because when you compare the activity you’ve done today versus the week before, there is growth and that’s why day one is so powerful because it becomes the first example in this new portion of your book that you can turn back to and go, I remember when day one was hard. I remember when I got it done. I remember where I started. I remember how good it felt to do what I did because I chose to celebrate the moment versus beat myself up. I chose to look at that as a moment in time where I’ve committed to myself to move forward, not perfectly, but just to celebrate the progress. Now, I’m going to have a podcast right after this one that’s going to talk about the first 14 days and celebrating that progress, so I don’t want to jump into that too much. I just want to talk about day one. Day one is when to be honored and celebrated. You did it. It doesn’t matter what it look like. Did it align with how wanted to feel? Because here’s the reality, regardless of how long we do a workout, it’s not about quantity, it’s about quality, and quality comes in many forms. When we actually get it done, it’s freaking hard in the moment. The sweating, the difficulty moving your body if you’re in that situation, all of a sudden soreness becomes compounded in terms of pain. We start sweating. We can feel our skins turning red. There’s a lot of discomfort going on in our body, but we’re fighting through it, right? But this two to three minutes turn to five minutes, and the continue to grow, but here’s the reality. There is a brain chemical reaction to you moving your body. There’s endorphins, there dopamine, there’s serotonin. I’m not a scientist, I just know they’re there, and that Google tells me. Anyway, obviously, check your resources, but the reality is they exist, and when we begin to move our body, those things begin to fire and here’s the truth, once you complete your workout, and you take that breath, there’s something that happens. At some point after workout where you have this deep cleansing breath. You might not have been breathing well. Maybe even been breathing shallowly at the top of your throat, but exercise makes you breath deeper, and there might be emotion attached to it. Nobody said, I regret that workout. Ever see that meme? Said no one ever. I regretted that workout said no one ever because there is a chemical change that occurs in our brain, and there’s something about the breath. I was recently reminded of this as I have dived into yoga, and I’ll talk about that in the next episode and I had the realization that I hadn’t been breathing. Now, obviously, I was breathing enough to live, but really focus on breathing in the idea of cleansing, and don’t be surprised if you get emotional because a lot of us haven’t breathed to that degree. I took my breath in and they really talk about like when you breath in to really drag it up through your throat and I got that. I could feel it through the back of my neck. I was like, whoa it’s cool, and I felt really, really energized on the breath in, and they wanted to us to do this exhale through the mouth with sound. Aahhh like that. It was even deeper. It was even more profound than that. That’s my podcast version, and I would get emotional, and I would be on the verge of tears, and then I would take that breath in, the next one, and I felt cleansed. I felt good. I felt energized, and then I would exhale, and I was doing everything I possibly could to not cry. Now, should I hold my emotions back? No, but it is a shock to the system and I had to remind myself that I’ve been in this place before. When you take that cleansing breath and you might cry, and you might not understand what that is. It’s a release. I told you we wear our stories in our body. We wear our struggles on our body. We wear our stories ever becoming in our body, in our joints, in our muscles, in our cells. When we begin to move our body from a place of self-love, there’s a lot of feelings that come along with that. Another reason day one can be difficult is because well, it’s hard. It was hard, but you did it, and that’s what you have to look at and you can do it again if you’ve done it once. You can do it again, but when you move forward with it, and not worrying about the scale, and not worrying about the wedding, and not worrying about the vacation. Not worrying about summer coming up, but you just go in with the focus of coming from a place health gains, you’d be amazed at what begins to happen to your body because changes are going to start to happen. They happen. That’s the reality of moving your body. Day one is also a day where you can really, really, really tap into what’s possible. You can look around the gym, or look at the workout DVD, or look at the instruction in front of the class, or look at your friend that’s maybe doing a little longer than you or the person next to you who’s a complete stranger. It’s a place that you can look and see all these examples around you of what’s possible, because I can almost guarantee that every person that’s surrounding you or even on the workout DVD, and having known people in workout DVDs, guess what they had? They had a day one. They had struggle to overcome, and just because they’re one into the spectrum, the opposite of the spectrum maybe where my body is. They’re struggles no less. They’re challenges are no less. They’re day one was no less difficult. Everybody has a day one. I’m going to get into a little bit more about what to do after day one, but first I want to tell you, just take the time to mentally prepare. Get pen to paper, figure out, and I do love the idea of pen to paper. I learned this from one of my business mentors, it really does work with a different part of your brain versus like typing in on the computer, but what’s stopping you? And why are you really doing it? When you find yourself that you’re coming from a place that’s associated with a number on the scale, or size on your pants or dress, or whatever it is, take it back to how’s it that you want to feel, and just take everything else away. Take away all the goals. Take away what the doctor said, what aunt Sally said on Thanksgiving. Just put it all away, and not worry about it, and prep your mind and spirit, and just commit to doing one of moving your body. Just one day. That’s it. Not worrying about a 30-day program. If you’re going to like the workout. If you’re not, date it. Just date your workout. Just go and find a way to move your body even if it’s cranking up the music at home and just dancing wildly in your house in your underwear when nobody else is around. Or finally doing it when the kids are around, and just cranking up the music and finding that they join in with you. They don’t judge you. They join in with you. They want to dance with you. It’s energy. It’s an energy exchange, and focus on nothing else just that moment. That you’re going to do this. What has held you back before? You have tons of data sets. You’ve had this day one before. You have had this experience before. How did you feel? What did you learn? Or what can you learn from how you felt and what can you do differently? Because here’s something we’re going to talk a lot about on Fit Has No Size podcast, is how to use your past. I wish you could see me doing air quotes, but “failures” for your future successes. They’re valuable data sets. You can at the end of this podcast change your mind about how you approach day one purely based off of your previous experiences and giving yourself permission to move forward in your journey without any judgment, and without expectation except celebrating that you got it done. That’s it, and watch the magic unfold. The minute that we start focusing on a timeline or what’s supposed to happen, or what the “experts” tell us. There’s a lot of experts out there that have a lot to tell us, okay. Let me just tell you, from one person to another, just commit to moving your body. Look at how handled it in the past. What you’ve learned from it, and how you can do it differently this time, and then celebrate the [inaudible 00:23:54] out of it. Celebrate it. Like I did it. Jump up and down. Celebrate it. Say really cool things to yourself just like I did it. Feel like an athlete. Feel like that you got that gold medal. Whatever it is that you need to feel, allow the emotions to happen if they happen. Day one’s a big deal. Now, that I’ve gotten through day one and in the next podcast, I’m going to be talking to you about the first 14 days in a way that changed my life, and I teach this a lot, and I want to tell you how you can take the next 14 days ad completely change the way you look at fitness, and watch it seep in to every other part of your life. If you don’t follow me on social media, please do. You can find me on Facebook, YouTube, Pinterest as Coach Tulin, and you can find me on Instagram @iamtulin, or you can simply go to the fithasnosize.com website and you can learn more about my Fit Has No Size membership community there. Please note it’s not open at all times. We open it on occasion, but you’re welcome to join the wait list. I would love to hear in the comments below how this podcast helped you. Did you change your mind about something? Did you go and apply it? I want to hear about your day one. So, don’t forget to leave a rating in your comment. I can’t wait to hear how your journey to day one went.